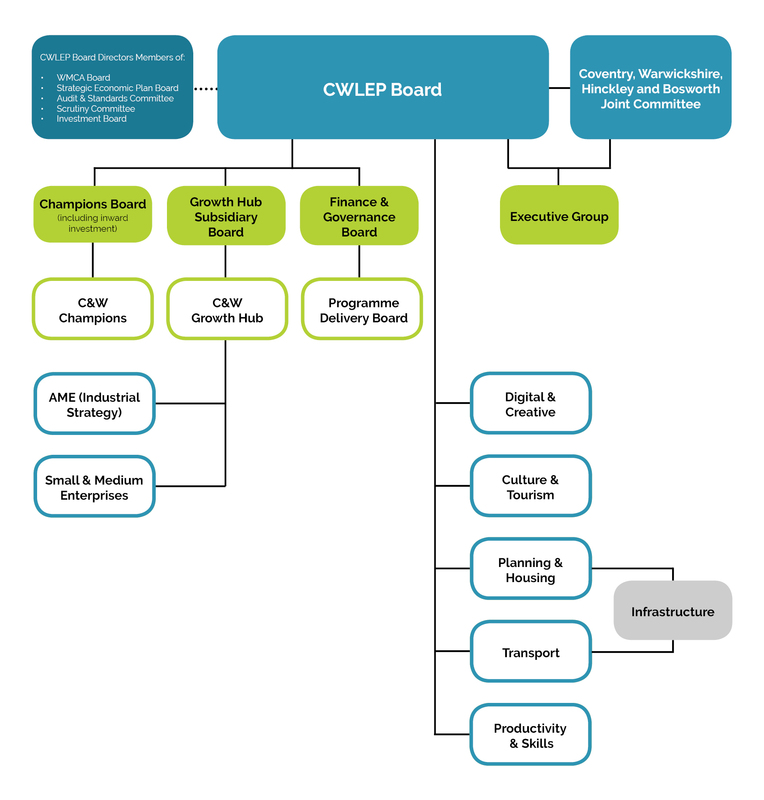 The CWLEP Board plays a pivotal role at both policy and programme level. Valuing a business-led approach to driving growth, its 16 members include 8 from the private sector (2 of which are SMEs), 6 from the public sector and 2 from universities. It’s supported by the Joint Committee, the Growth Deal Sub-Committee and the Executive and Secretariat Group, and benefits from business intelligence and progress reports from CW Growth Hub. As the Accountable Body, Coventry City Council is legally accountable for receiving funding, making payments, and for overseeing compliance to the Assurance Framework. No salaries or bonuses are paid to any of the CWLEP’s Board members, and they must declare conflicts of interest and are bound by codes of conduct on accepting gifts and hospitality. In cases where it’s alleged the LEP is neglecting its responsibilities, there is a complaints procedure which can be escalated to the Local Government Ombudsman if required. The Coventry & Warwickshire LEP follows an Assurance Framework that sets out how we operate. The Assurance Framework was delegated by the CWLEP Board in February 2019 to the CWLEP Finance & Governance Board, and adopted by CWLEP Board in February 2019. It covers everything from how the board is formed and governed, how the LEP makes decisions, how programmes and funding are managed, and how stakeholders can get involved. We take these responsibilities seriously, which is why we offer a fully transparent decision-making process, provide democratic and financial accountability, and ensure that all procurement activities are governed by guidelines from Coventry City Council in compliance with UK and European Public Procurement Requirements. The Annual Conversation meetings are the formal process by which the Government and each LEP meet annually to: discuss the contribution the LEP has made towards driving forward local economic growth; to review LEP governance and assurance processes; to look at progress with delivery on key local growth programmes; and to discuss the LEP’s priorities and challenges for the year ahead. The 2017 Assurance Statement provides a brief formal account on the status of governance and transparency for CWLEP and the outcome of the 2017 Annual Conversation between CWLEP and Government. As with all CWLEP activity, the projects we consider must align with the aims and objectives of the Strategic Economic Plan. The project selection process begins with an open call for projects, where interested parties complete an Expression of Interest form for initial assessment. If successful, it moves on to the next stage where a full evidence-led business case is required in order to be assessed for funding allocation. Once projects are greenlit, their sponsors must complete regular risk assessments before and during delivery, and carry out post-programme monitoring and evaluation, with findings used to enhance the CWLEP’s economic intelligence going forward. Our valuable partnerships bring together organisations from across the public and private sector. We work closely with businesses ranging from SMEs to large corporations, Business Groups, Local Authorities, District Councils and Universities. We also welcome input from third parties such as the Highways Agency, Network Rail and other LEPs when considering the delivery and impact of the projects we deliver. The management approach is welcomed by BIS, which commented positively on the role of the team, referring to its robust and disciplined systems, and committed adherence to the Assurance Framework.